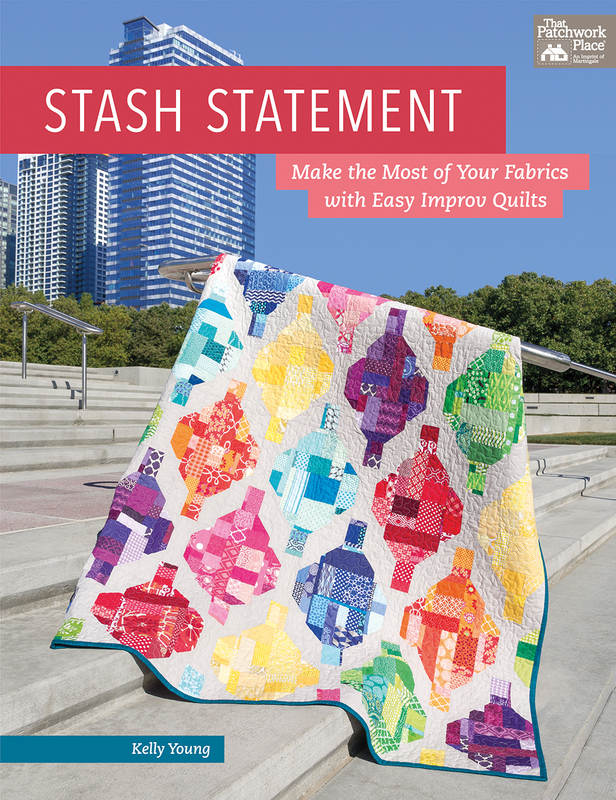 Planned improvisation is my thing, so when my bloggy friend Kelly Young of My Quilt Infatuation asked if I would participate in the blog tour for her new book, Stash Statement, I was quick to answer "yes!" 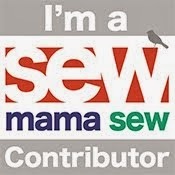 The book contains 12 patterns plus tips for organizing and sewing together your scraps. 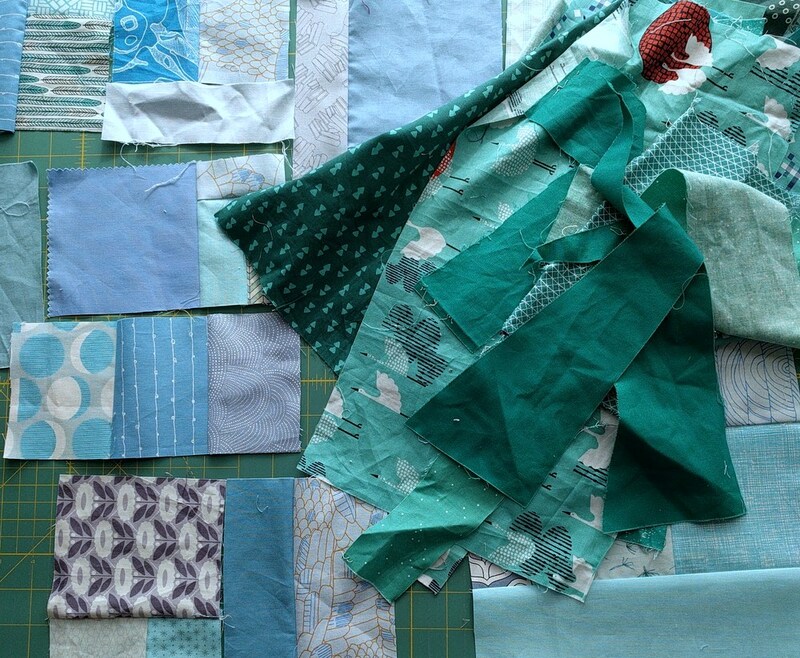 Kelly made me ponder some new ways to combine and then cut fabric scraps. 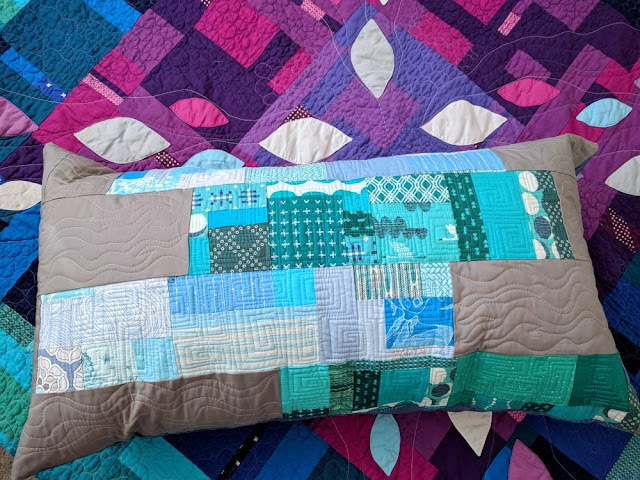 I was immediately drawn to the "Precarious" quilt. The layout of the blocks just screamed "body pillow" to me, so that's what I made! Each row of scraps is monochromatic like in Kelly's original rainbow-colored quilt, pictured above. Originally, I was inspired by a house in my town that's painted turquoise, blue, and brown (I used gray as my background color instead). I really enjoyed laying out my scraps and seeing what shapes they formed together. Once I pieced the pillow, I quilted it densely with three colors of 40 weight Aurifil thread: 4060 (Silver Moon), 2810 (Turquoise), and 3770 (Stonewashed Denim). For quilted pillows, I usually baste a layer of thin batting and a piece of muslin behind it to ensure stability. 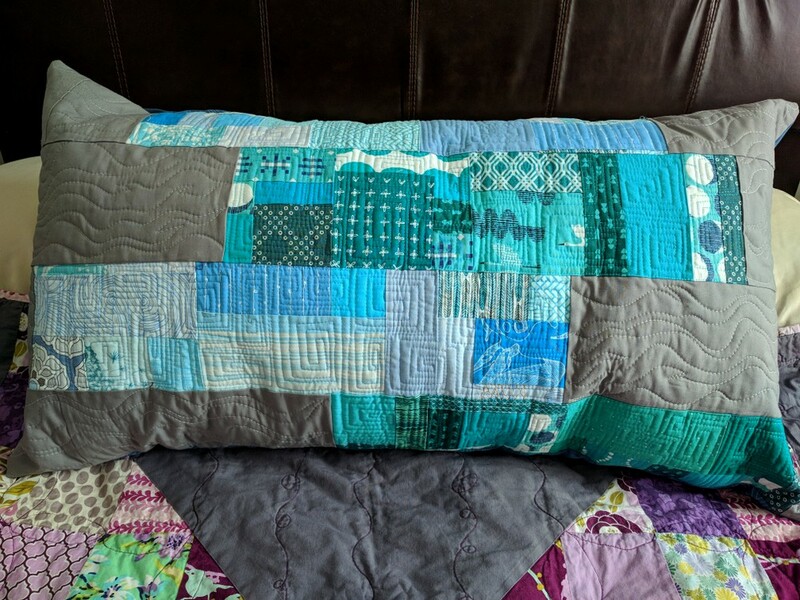 Though it's densely quilted, the pillow is super soft! 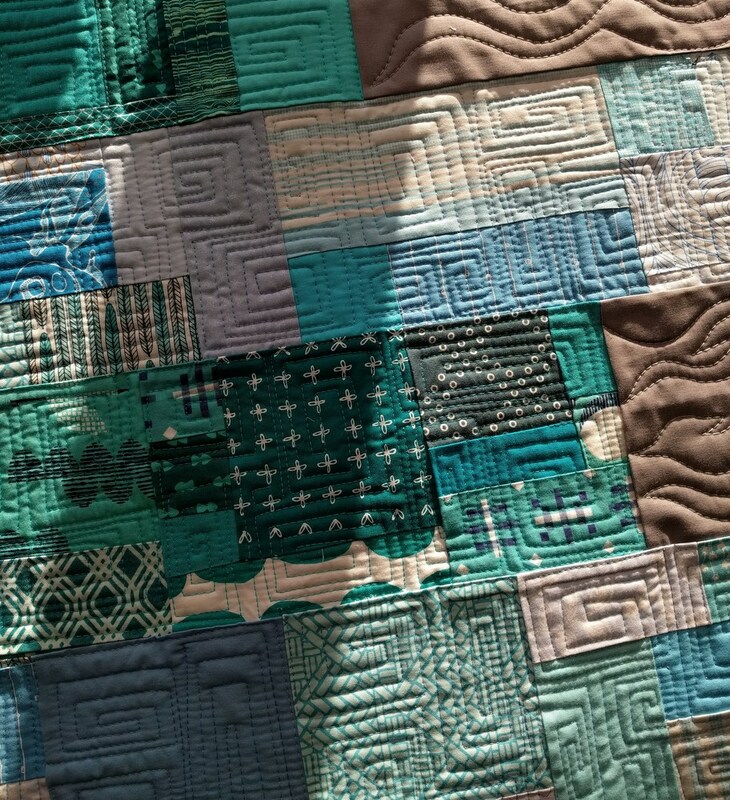 I was quilting at sunset one day and had to take this picture. The sun really shows off the texture. The backing was a long-stashed yard of Euclid linen by Carolyn Friedlander; I used up a whole yard with just a few small scraps left! I think it gives this pillow even more stability, and it meshes well with the front color scheme. I love to sneak my tags into pillow backings. This was a really fun "palate cleanser" of a project, and I really feel like I actually used up scraps this time (unlike other scrappy projects I tend to engage with. Haha). If you'd like a book that teaches you effective ways to use your scraps, make sure to check this one out! 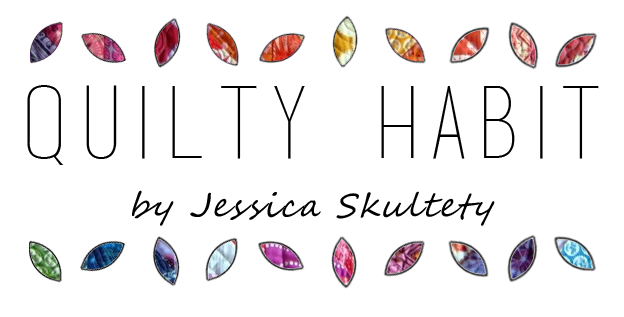 Visit Kelly's blog for a giveaway, and visited her Etsy shop for a signed copy. Please check your local quilt shop, Amazon, and Martingale for unsigned copies. Finally, view more book projects at the links below - enjoy! It's been 4 years since I last participated in my quilt guild's yearly bee. When our president Neva asked for interested parties last fall, I was finally ready to sign that paper again. Here's how our bees work: There is a maximum of 12 spots for each year (one person for each month, Jan. - Dec., and if we get 11, we skip July, our non-meeting month). 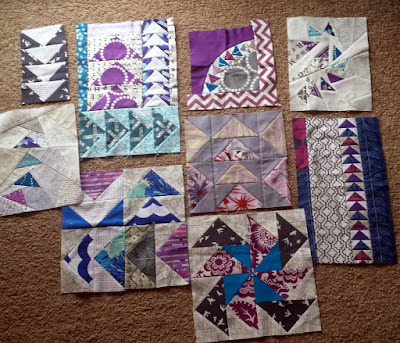 Each month, one quilter is the "queen bee" who decides on the pattern/tutorial/theme and can choose to pass out fabric, too. Each person in the bee makes a block, and then brings them to the next month's meeting to share with the whole guild. 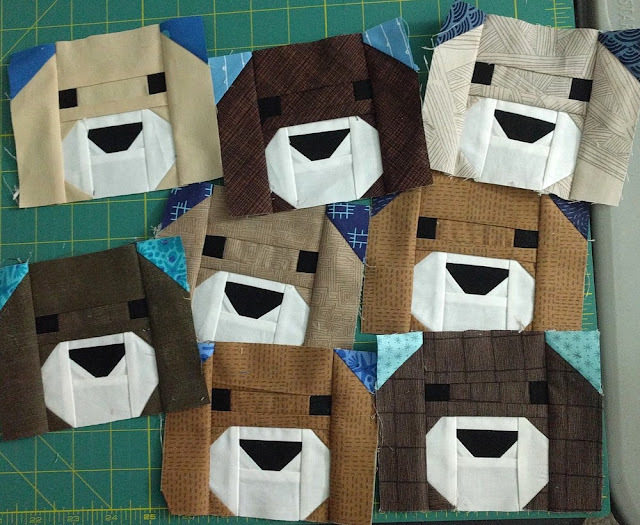 Then, the queen bee makes a quilt from all the blocks! Our bee is so popular that a second bee ran last year, the "New Bee" (newbie, get it?) 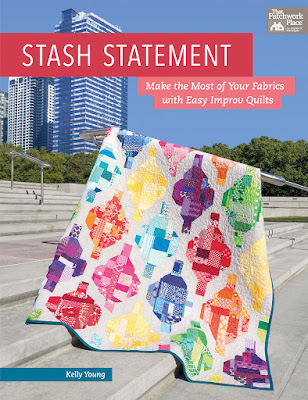 for quilters who wanted to make simple blocks only. Here are the reasons I love quilt bees of any kind (I've also done Round Robins, which are my favorites): you get to contribute to a quilt for someone (bonus points if it's for a friend). You can try different techniques and explore your piecing likes and dislikes. 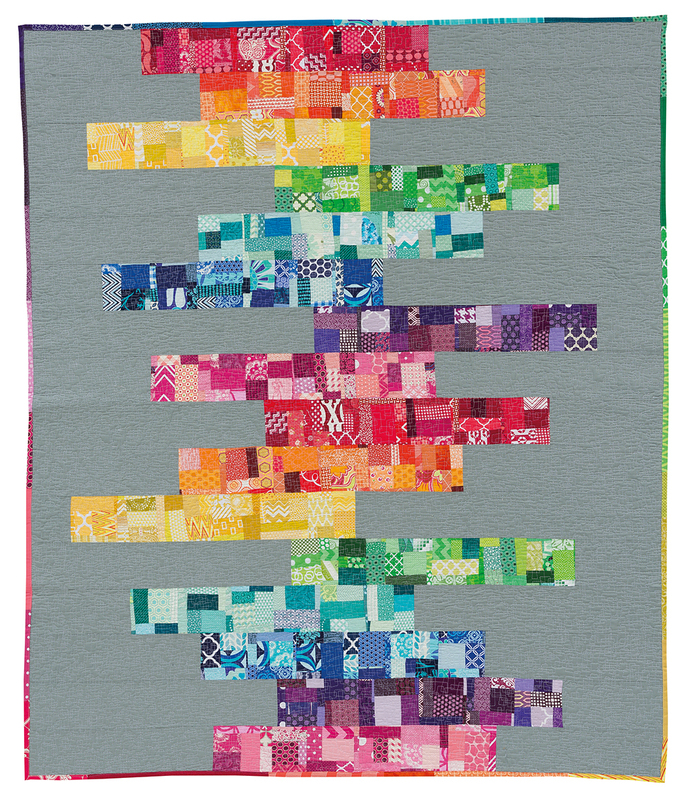 The opportunity arises to use precious fabrics or scraps from the stashes of other quilters. 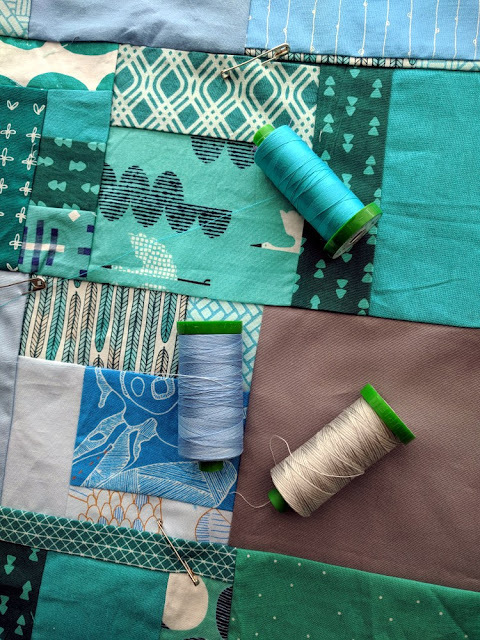 Most of the time, bee blocks are a quick make, and can be a fun, inspiring project. Blocks usually turn out unique to each maker; working together creates beautiful work. Here are the downsides. Relying on other people can be tricky. I have been involved in a very hairy, still-unresolved-after-YEARS (literally years) quilt bee situation. People drop off the map, don't get in touch, etc. It's frustrating and hurtful to all parties involved. Quilts are personal, emotional, and financial investments. 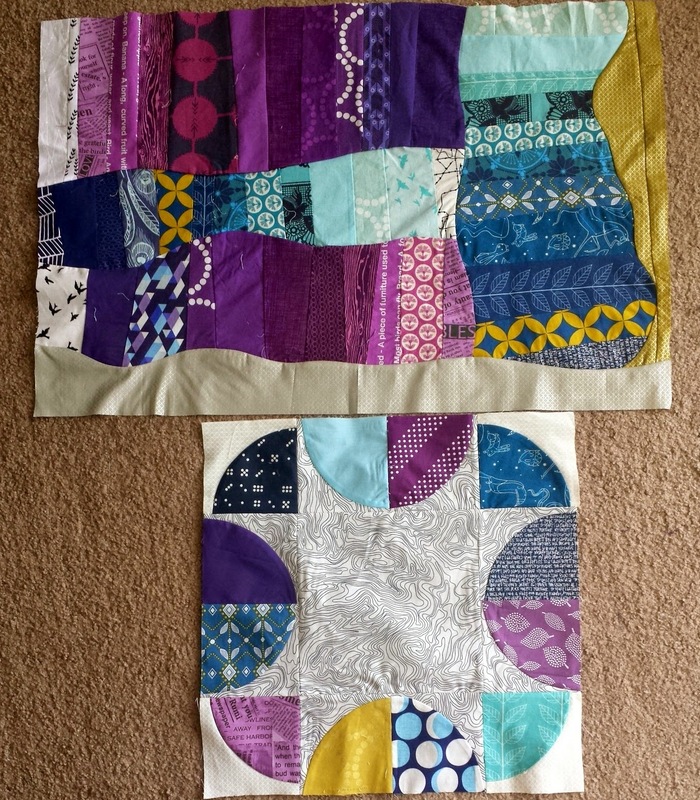 The first blocks of my traveling curve-themed round robin quilt, which is now being quilted. More on that hopefully this year! On the less dramatic note, blocks *can* be time consuming. It might be another difficult deadline to complete, depending what's already on your plate (this is the main reason I refrained from signing up the last few years). You might receive instructions to create a quilt block that you are really uncomfortable with. In my other guild bee experience, a queen bee asked for reverse applique, and no matter how much I tried, I could not make the block look the way it was supposed to. I felt bad because it was supposed to be a part of her quilt - I still handed it in at the meeting, but it always haunted me. For a guild bee, there's generally less risk involved. These are people you see every month or so, whether or not you know them well. 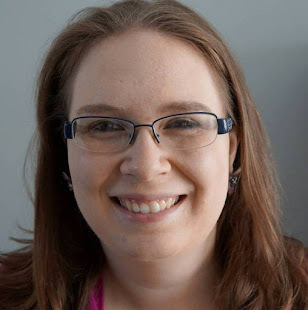 You can ask for help in person if you need it, and there are no mailing costs (unless you can't make the meeting). And best of all, this time around, it's given me an opportunity to make a quick block/palate cleanser before I work on my own more thought-and-time-consuming work. So, into the bee I go. My month is July, and I'm starting to cobble together a plan for my beemates! I'll certainly blog about it further when the time comes. 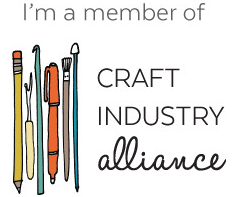 So, have you joined a quilt bee? If not, would you like to? What do you like/dislike about the experience? Four years ago, I made a secret quilt for my husband, the giant Dr. Who churn dash quilt (that blog post includes "8 Steps to Making a Quilt for your Significant Other"). 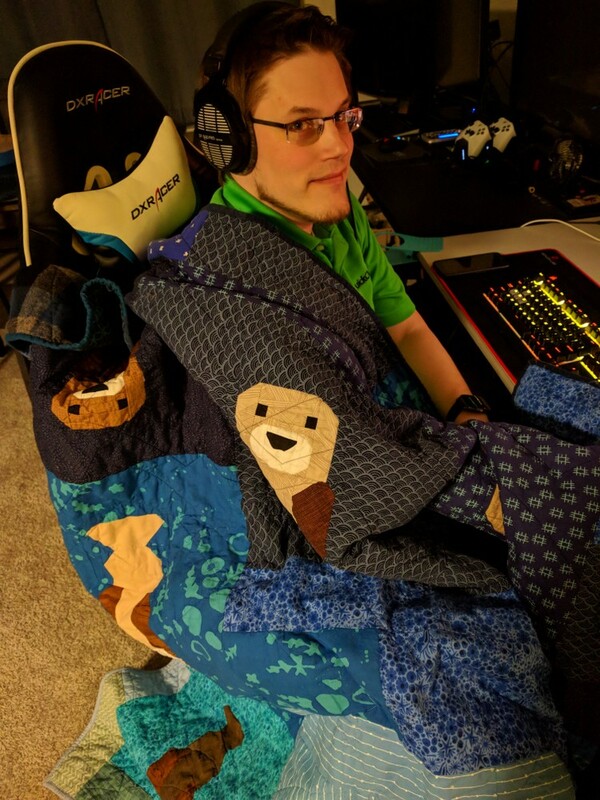 That quilt has been used just about every. single. day., sometimes for hours on end (so at this point that's 1,460+ days). It's been washed many times, and some of the quilting has even come out. It's cozy and truly a staple in our home. 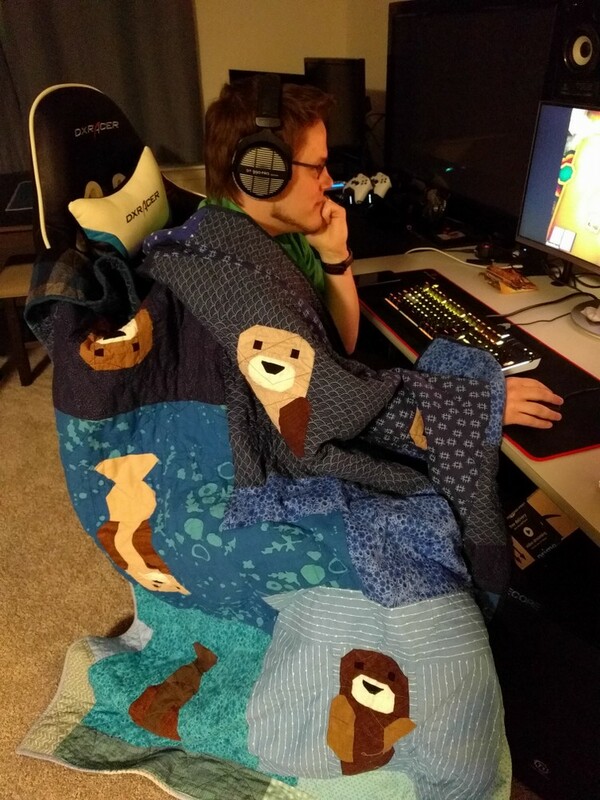 About a year ago, I found out that Mike loves sea otters. LOVES them. How I had not known this fact after being a couple for almost 12 years, I'm not sure, but it was nice to know there are still some surprises left to discover. :) Ha. 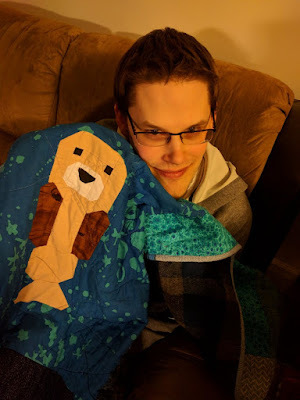 So, when I saw Elizabeth Hartman's "Awesome Ocean" pattern and showed Mike, he was SO excited and immediately started begging for another quilt (even though it's labelled a manatee in the pattern). With that level of enthusiasm, I really couldn't say no. 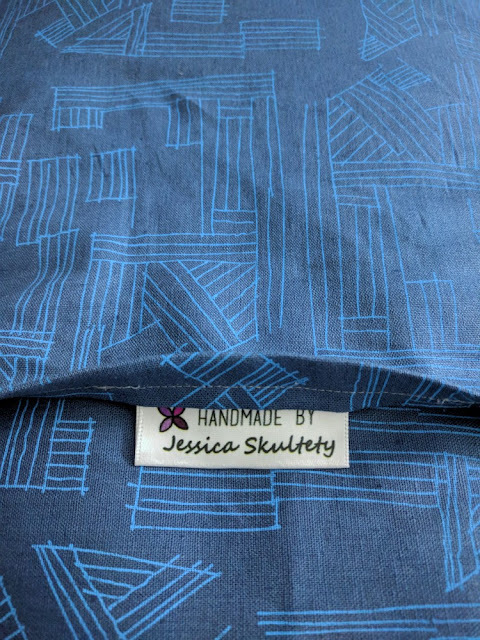 If I purchase a pattern, which is pretty rare (since I like creating my own designs), I usually stray away from the original layout. This pattern was no different since the original design contains all the cute sea animals. For my recent collaborative quilt with my niece, we chose just three animals and the coral. While I'm thrilled with the results of both sea animal quilts, the cutting expectations for them were no joke. Phew. I cut out the pieces for 8 otters and labelled them all with pieces of Post-Its and Wonder Clips, separating each otter in a plastic bag. After that huge effort, I really didn't want to sew them together, so they sat in one of my plastic project bins for a few weeks. Eventually, I got tired of seeing them sit there, so I started chain piecing, and eventually some faces appeared. They are so cute and just a little squinty eyed, since I refused to use pins. :) Honestly, I wouldn't have them any other way. Once the otters themselves were done (a bit quicker than I expected; I think we had another big snow storm that week), I gave Mike a few options for the layout. 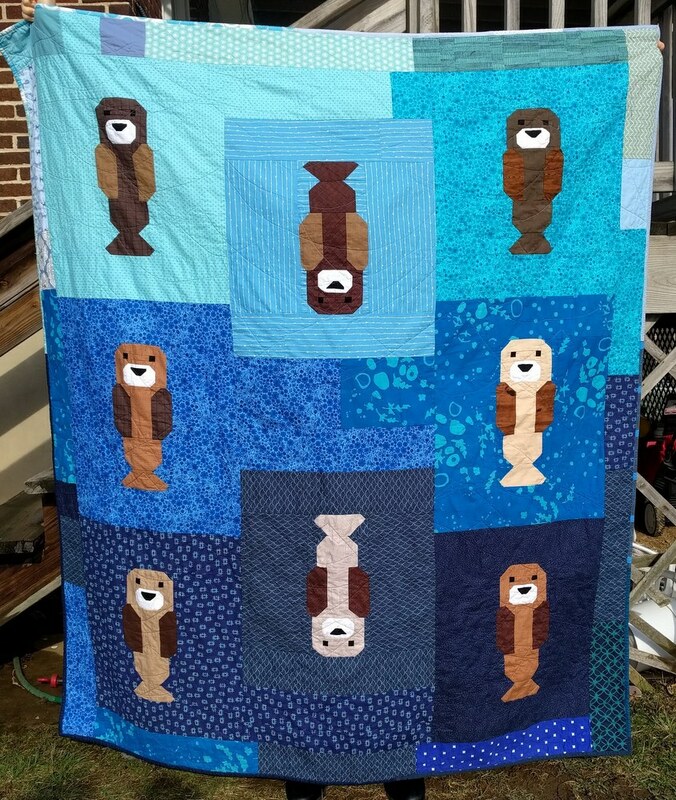 He liked the idea of otters swimming in different directions (yay!). I had purposefully created a blue background light to dark (like many of my quilts) to create some interest, so I used that to inform the final layout. And I loved creating the ombre binding (pictured below) to match with the changing quilt background! Did you know that a group of otters in water is called a "raft?" 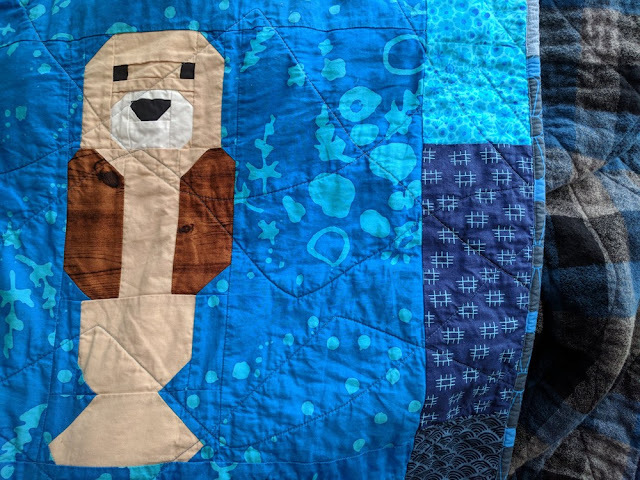 My wonderful guild friend Linda looked it up at our last sewing day as I was cutting out the approximately 1.5 million pieces to make 8 otters (okay, slight exaggeration). So, a quilt name was born. 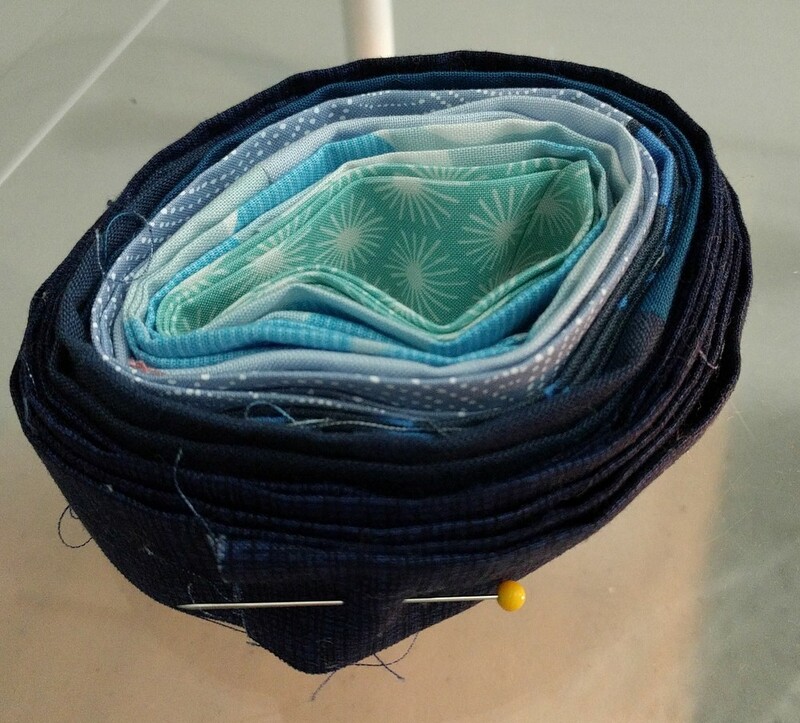 I used Aurifil thread 2715 (Robin's Egg), 4140 (Wedgewood), and 2745 (Midnight) to quilt overlapping waves using my walking foot. I usually quilt more densely, but figured I could always add more if necessary. 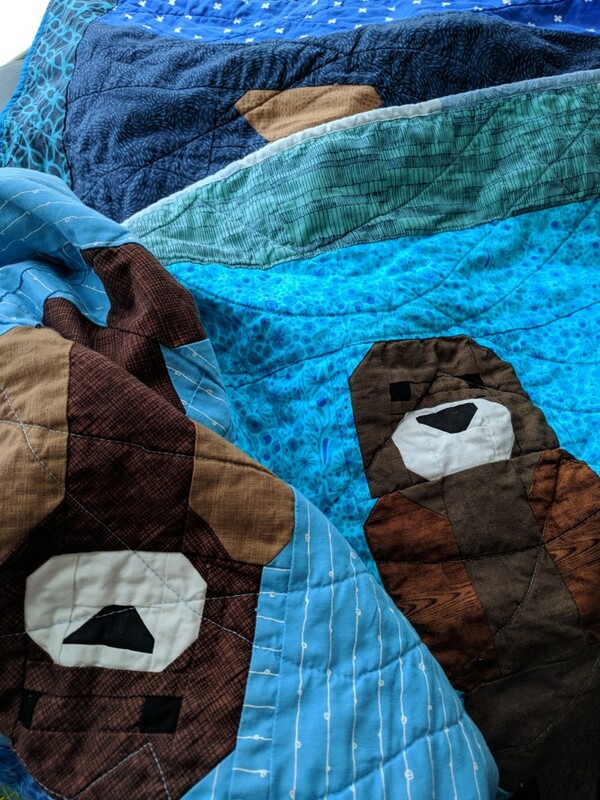 With the Mammoth Flannel backing, the whole quilt washed up beautifully. Mike has commented several times about how warm it is, and it's easy to see why it's the current quilt of choice on the couch for both of us. 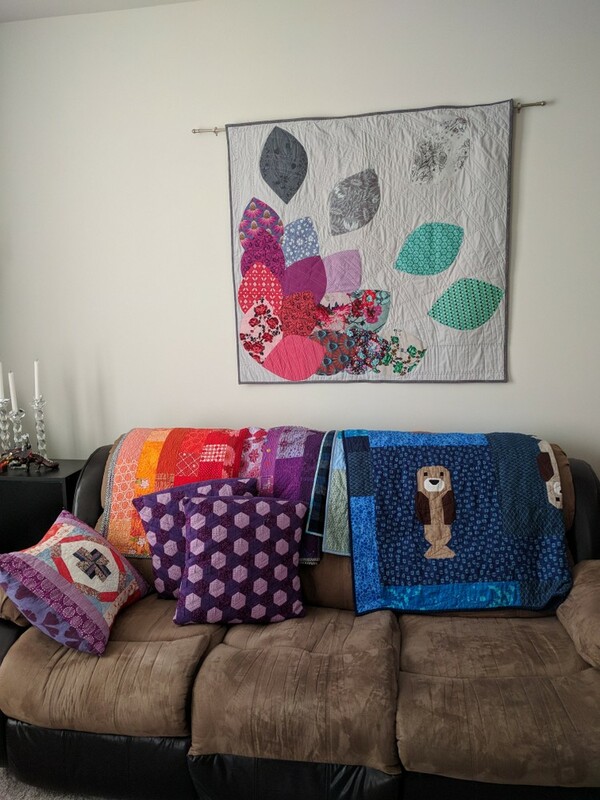 Pictured with lots of past projects including my guild's quilt made for me, purple fabric woven pillows from Shannon of the Jersey Shore MQG, my recent paper-pieced pillow, and Bouquet now hanging on the wall. I love a colorful house! Linking up to Needle and Thread Thursday, Crazy Mom Quilts, TGIFF.